The information contained in the oratab should always be updated, but it is not always reliable. If you want to know what Oracle installations you have in a server, better to get it from the Oracle Universal Installer or, if you want some shortcuts, do some grep magics inside the inventory with the shell. 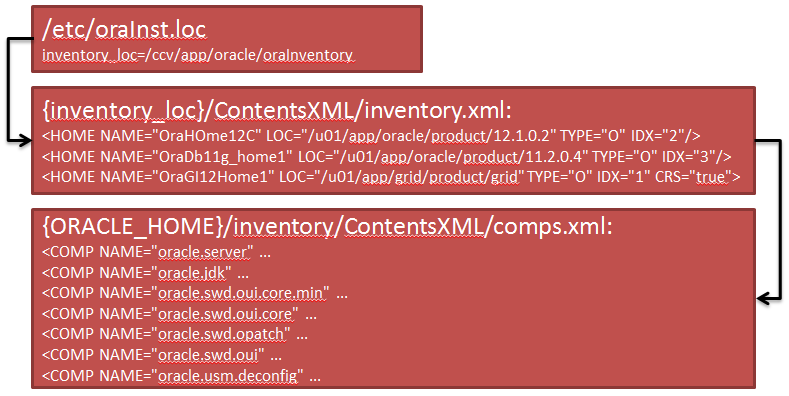 The following diagram is a simplified structure of the inventory that shows what entries are present in the central inventory (one per server) and the local inventories (one per Oracle Home). You can use this simple function to get some content out of it, including the edition (that information is a step deeper in the local inventory). This entry was posted in Oracle Database, Oracle Database 12c, Trivadis Blog by Ludovico. Bookmark the permalink. I added one small change to ignore detached/removed oracle homes.